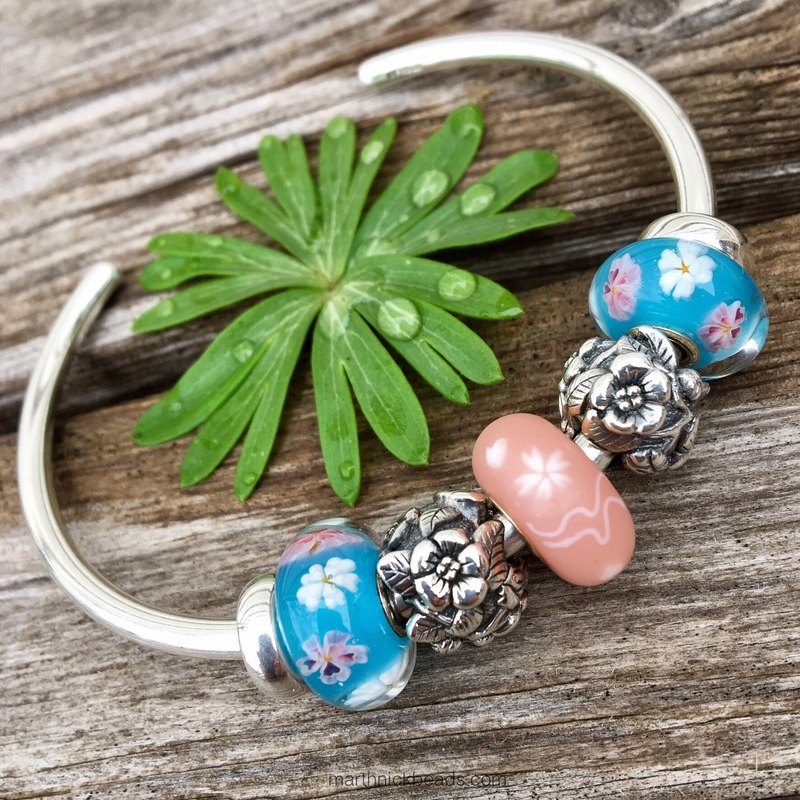 The German store Star Bijou has made a gorgeous silver Sakura bead for their house brand called Spiritbeads. It is just darling, comes cored with a 4mm or 4.5 mm opening and costs 45€. The 4.5mm opening one will work on a Pandora bracelet. 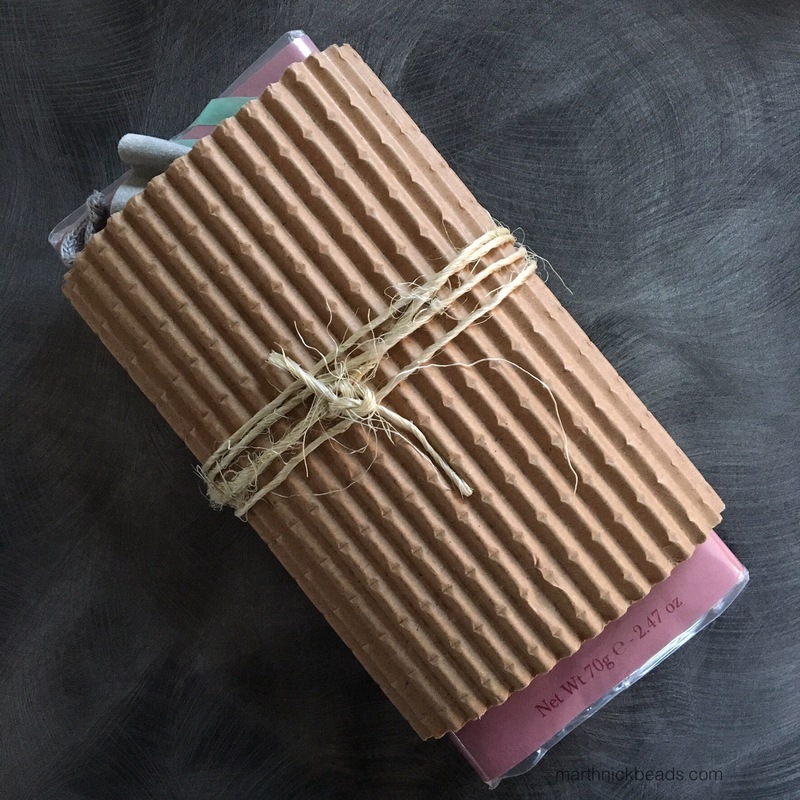 Once again, the creative packaging was a real delight. 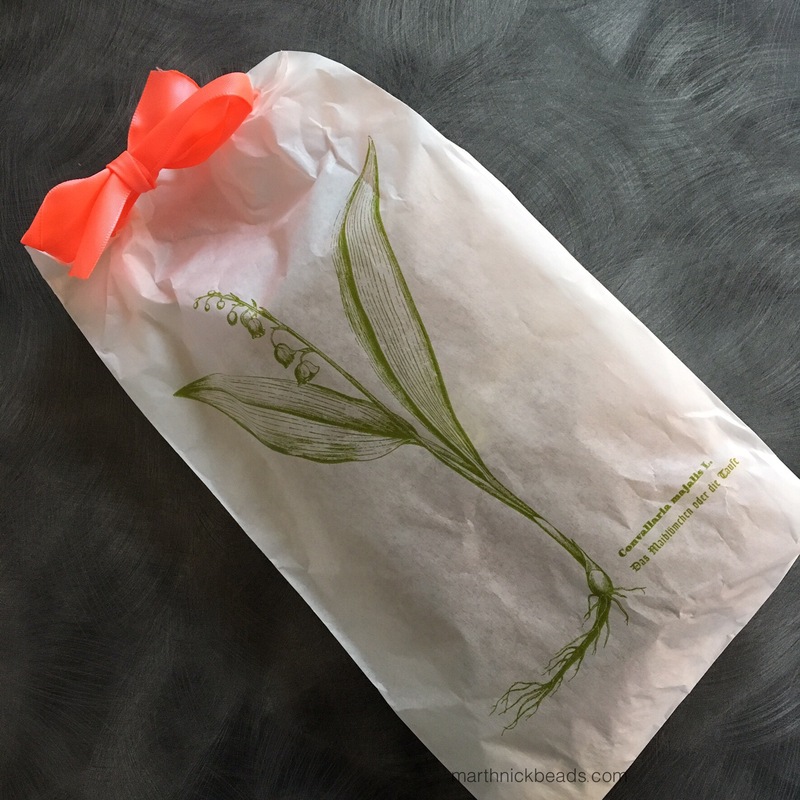 I can’t wait for my Lily of the Valley to grow! The bead has several blossoms and leaves. Today I’ve got five different combos with the silver Sakuras, but this one below is my favourite. 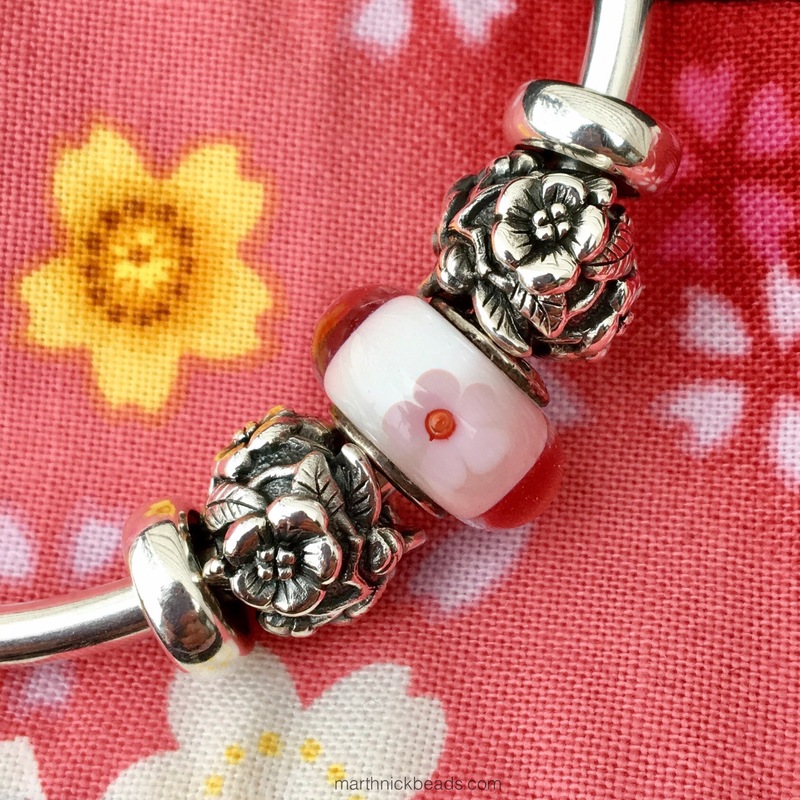 Because the detail is so delicate, I like them best with one Murano in the middle and in this case it’s the Pandora Cherry Blossom. The fabric in the background is a Japanese purse I bought at Epcot at WDW. I love the department store there! Anyway, I just love the crisp white of the glass bead with the shiny silver. However, one can’t help but think of the Trollbeads glass Blooming Sakura beads in this instance. I also added in the Sakura bead from the Kimono Kit. I’ve only seen cherry blossoms once in my life and that was when we were living in South Korea. There was a city near Busan where we lived, called Jinhae and they had a cherry blossom festival in the spring. We took a day trip there on our one day off of the week (we worked 6 days/week) and enjoyed walking around seeing the blossoms. I remember it was like seeing clouds of pale pink everywhere, so pretty! I tried a bangle using the Chamilia Blush Metallic beads. 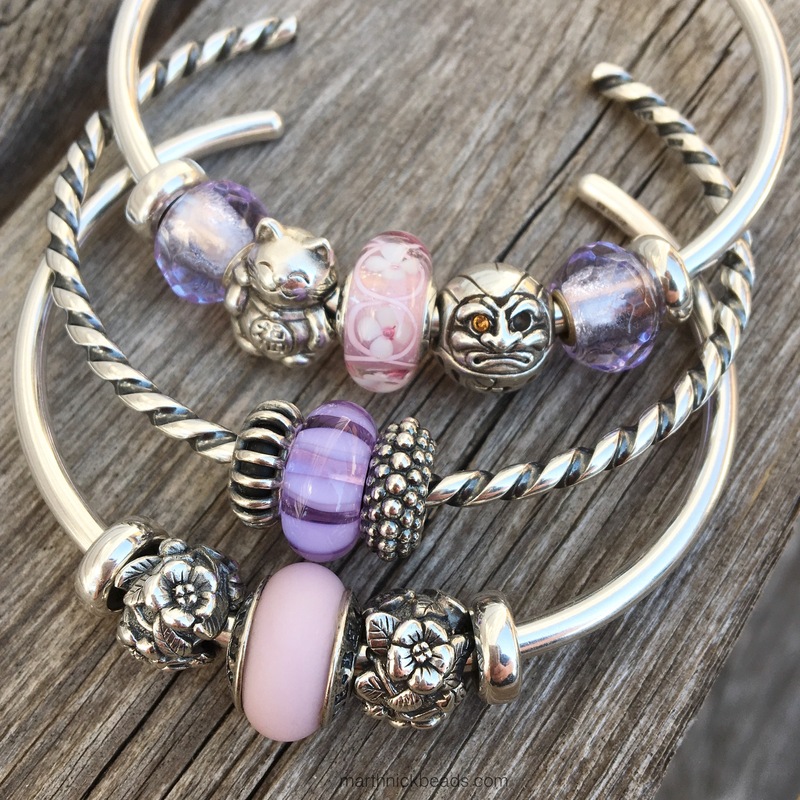 Next is a trio of bangles using the Trollbeads Lavender Prisms, a Lavender Stripe bead, True Beadz True Touch Baby Pink, the new Pandora Pink Field of Flowers and two more Japanese inspired Spiritbeads called Maneki-neko and Daruma. Lastly, here’s a Japanese themed bracelet with the Redbalifrog Kimono as a focal bead. These days I’m putting little dangle on the lock of a bracelet, so here I’ve used one from the Ohm Beads Woodstock Collection. 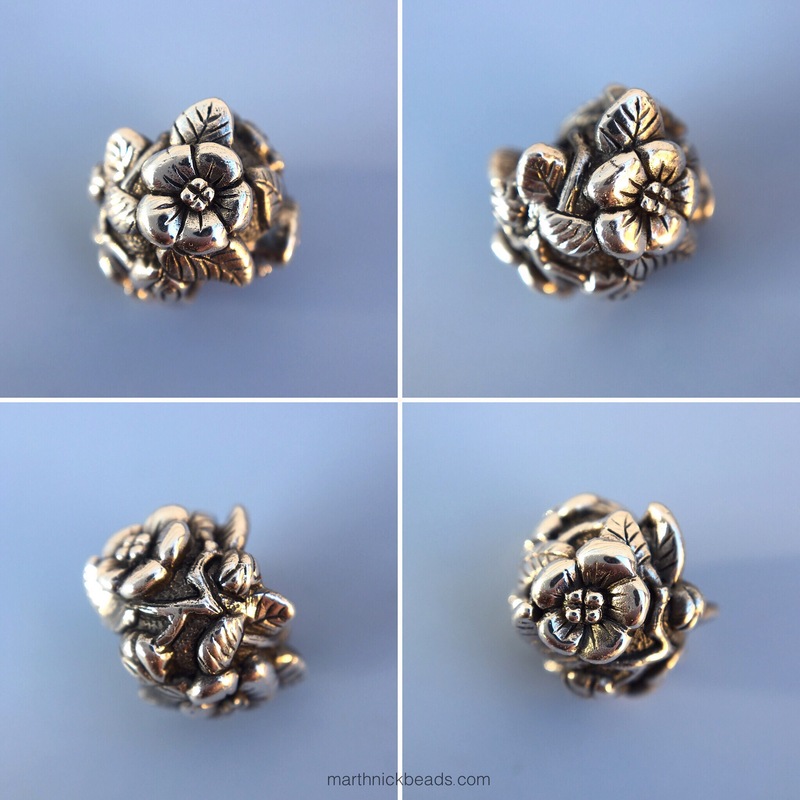 Hope you’ve enjoyed a look at these sweet silver Sakura beads. I am going to use them a LOT as I really like the size and detail. Will these be going on anyone’s list? 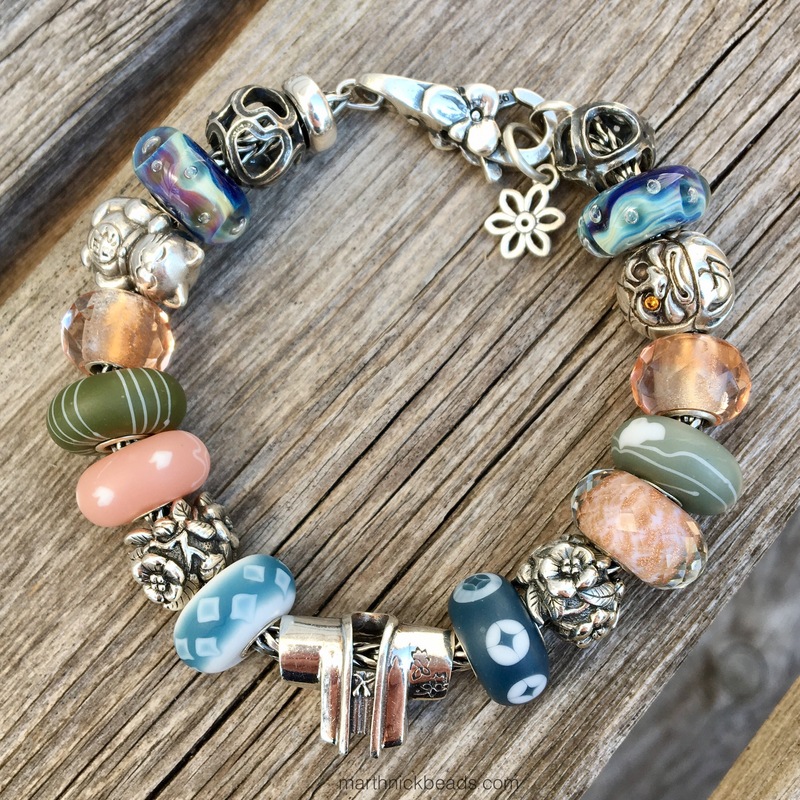 I love the Sakura bead and every combination you’ve done with it, Martha! I have a “thing” for Asian influenced beads and these are so pretty. I need to get some of the Woodstock dangles to put on the locks. I love that!!! Thanks Suzanne! I have liked all of the Asian influences Spiritbeads so far but these are maybe my favourites, along with the dragons. I don’t know why I’m into dangles all of a sudden, but am finding them to be so much fun. At the moment I am trying to reset my Star Bijou password because of your beautiful photos. 😉 I have been so impressed by their silvers lately and the Sakura is no exception. I LOVE the dangle on the lock too Martha! I can’t believe my taste has changed so much over the past year to loving full bracelets now! Daruma and Sakura are going on my wish lists (those Sakura are SO versatile for a practical bead addict like me;). I think maybe the spirit beads dragon may still be at the top though…and don’t even get me started on those Kimono glass! 😍 Beautiful styles and photos Martha!! Thanks Tanya! The dragon is really quite special, I think! The Sakura beads are super versatile, as you say. I really like the size. Let me know if you spring for the Kimono Kit. I think I saw two people on IG this morning who recently bought it! How I love that Kimono kit! That would be my ultimate find. Last I heard Star Bijou still has some! Just checked. It says “not available”. Thanks anyway, Martha. I’ll keep looking. Darn! Ok, I’ll keep an eye out. Martha, I’ve been looking at your Instagram photos again! The one with your friends after coffee and bead shopping. I think it might be you with the leather bracelet? Could you please tell me what the pendant is with the hearts dangle?!! Hi Suzanne! Ok, so that is my friend Cheryl. The heart dangle is by Waxing Poetic and is called Waxy Heart Charm. I’m on the bottom with the pink, Trisha is on the left and she went with just silver with the intent of putting some glass on. At the top is Sarah who has an amazing eye for colour. Her Pandora combos are super popular. On the right is the owner of the store, Jennifer! Thank you, Martha. I guess I’d better check out Waxing Poetic now!!! There is a lot of bead goodness on those four wrists! I bet you have a great time together. Oh yes, we really do. Sarah lives in a different city an hour away, but we get together when we can. I like the first photo also. I went to Skyway Jewelry at Oakville for buy 3 get 1 free, I got three 2016 LE X’mas bead ( cream and gold one ) $39 each ( 6 beads set is $318, each should be $53 ) and one free Hydrangea. Very happy for my bead hurt even took us one hour drive, I went with my husband and the other couples went Oakville lake front tour first. My friend bought one transaction also, we both happy. Skyway carries more Trollbead than Earthwork, bead, ring, neck bangle and a few gold bead. Very friendly service. Wow, what a great deal you got! Let’s hope the store does well and that more Canadian shops will start to carry Trollbeads. I get tired of Pandora expensive CZ bead. Trollbead is more fun to play with, like it. I will go back Hong Kong in August, I will go to Trollbead concept store there, 5 of them. There is definitely a lot one can do with Trollbeads, especially if you have a Fantasy Necklace. That will be fun to check out the HK stores! 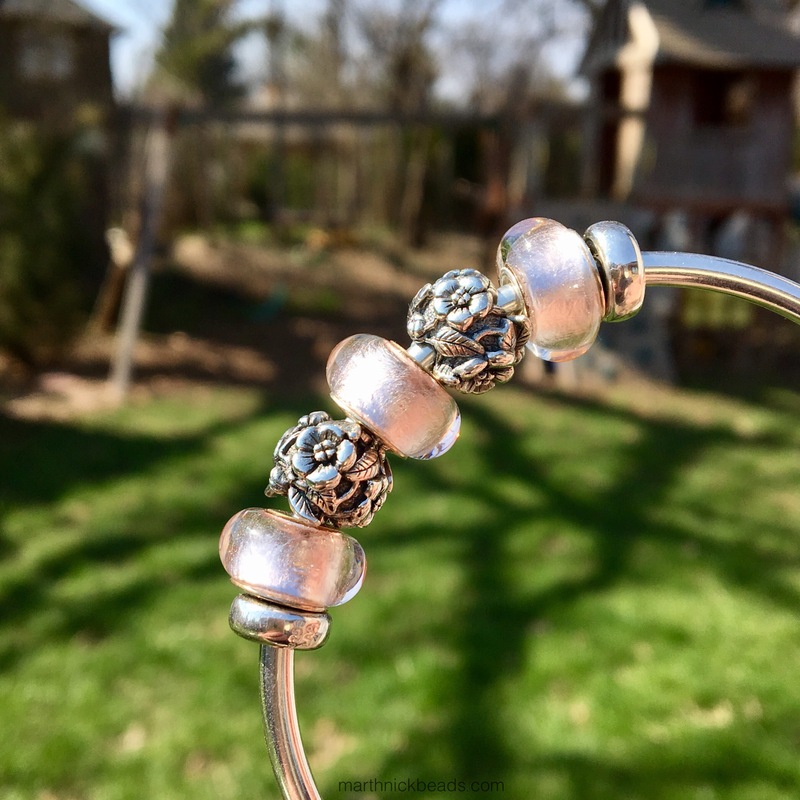 Thanks to your designs, I’m definitely putting the silver Sakura beads on my ever growing wish list. If people want individual Kimono Kit beads, Swiss Flower & Gift Cottage have several of most of the designs. I’m thinking that maybe buying the Kimono kit beads individually would be the way to go. I don’t know if all six could be found, but right now I don’t have any. Then if I ever do find the complete kit I’ll just have some duplicates which would be fine with me. Did you look at the selection at the place Marisa suggested above? I’ve never looked at that store until today but they have individual photos of beads and I think there were the two green ones and the darker blue one from the Kimono Kit. I just did. That would be half of them at least. I wonder if the rest are going to be harder to find. I thought I would check to see if anyone else has individual ones. Trollbeads Akron also has the darker blue one and the green with stripes. I wasn’t going to do it seperately, but it would be a start. Yeah. I did ask the wholesale director for the USA a few weeks ago about the kit and he doesn’t know of any available. I feel super lucky to have gotten one from Star Bijou. I’ll ask my British Instagram friends to keep their eyes out as they often go to shops over there. That would be great, Martha. Thank you very much. To think a few months ago I didn’t even know what a Trollbead was!